E-Cig and Life insurance-Exciting News for E-Cig Users! There seems to be a lot of controversy nowadays about whether or not electronic cigarettes or “E-Cig’s” are any healthier than traditional smoking, and the truth is, we’re not going to shed any light on this issue in this article. What we want to discuss is how an electronic cigarette user can qualify for a “Non-tobacco rate” on his or her life insurance policy. This does not apply to all the top rated best life insurance companies we work with. You need to read this article to understand how to achieve a non-tobacco life insurance rate when using electronic cigarettes. Exciting News for E-Cig Users! “In the past 12 months have you used any nicotine or tobacco products? So here’s your answer: if you’ve used an electronic cigarette in the past 12 month, and you are applying for life insurance, the answer to this question is “Yes” you have used a nicotine product in the past 12 months! Oops, I didn’t realize you meant “ANY” nicotine product! 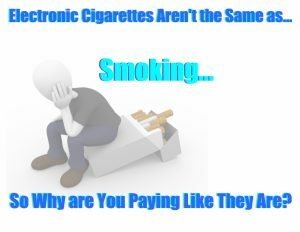 We can’t tell you how many times we’ve had a client tell us that they don’t smoke anymore only to find out after they have taken their medical exam that there was nicotine in their blood work. When this happens, it really does cause a ton of problems (which we’ll get to later in this article). What do you mean there was nicotine in my system, I told you I quit smoking a year ago! Electronic cigarettes contain nicotine. If you use them, the vast majority of life insurance companies are going to consider you a typical “tobacco” smoker, and give you a life insurance tobacco user rate class. A tobacco rate will generally cost two to three times more than a non-tobacco rate. This is why you need to let your insurance agent know that you use electronic cigarettes right a way. If you don’t, you may be quoted the wrong rate with the wrong company. As a result, you will end up testing positive for nicotine and find yourself with a tobacco rating which will have consequences that won’t easily be reversed! If you don’t admit nicotine use in the beginning, you can’t admit later on. It is very important to admit your nicotine use in the beginning of the insurance application process. This is because, insurance companies don’t like it when they uncover nicotine use during the medical exam after its use has been denied on the application. In fact, when this occurs, insurance companies will share this information with one another preventing that client from receiving a “non-tobacco rate” for 12 months after their initial application… So you really need to be honest from the very beginning! Every life insurance company out there is going to have a set of guidelines that they’ll follow when it comes to approving an application for life insurance. That is why it is essential to choose an electronic cigarette friendly life insurance company. The different life insurance companies underwriting guidelines are designed, not only to determine who the insurance carrier will and won’t insure, but also help determine the rate class that each applicant will be placed in when it comes time to determine the cost of the insurance being applied for. And what that means is that while one insurance carrier may use be very strict when it comes to tobacco use, another carrier may not! In other words, you need to make sure you are applying with a life insurance company that does not consider electronic cigarettes “tobacco use”. It’s simple, the life insurance industry is a very competitive industry, and unlike other insurance products, when a client decides to purchase a life insurance policy, that sale will typically last for years if not decades! This is why, many different insurance companies find themselves having to carve out a “niche” within the industry to gain a competitive advantage to obtain these highly valuable clients.Our job is to find the company catering to your niche, in this instance the company that does not penalize you for electronic cigarettes and life insurance. And this is exactly what we are seeing when it comes to individuals applying for life insurance with electronic cigarettes and other forms of “smokeless” tobacco! In fact, there is one insurance company in particular that will basically assume that as long as your are smoking cigarettes specifically, all other forms of tobacco use could theoretically qualify for “non-tobacco” rates. The key takeaway is this: you need to apply with the most electronic cigarette friendly life insurance company. This is how you will lock into the best rates for electronic cigarette users looking for life insurance. Let us show you the way! Next Post: Top 4 Ways You Could Die Skiing This Season!